The Black Law Students Association (BLSA) presented prominent attorney, Robert H. McNeill Jr. with its second annual Outstanding Alumni Award on Feb. 27 at Southwestern Law School on the 35th anniversary of his California State Bar exam. “When I first got the call, I immediately said yes (to accepting the award), but it was my wife (Debra) who suggested that I do it on February 27th. That was really important to me,” McNiell explained to the bevy of students and lawyers gathered at prestigious Southwestern Law School in downtown Los Angeles. Accompanied by his wife, Debra and two daughters, Erica and Stacey, McNeill was also saluted by his esteemed colleagues and partners with the highly successful Ivie, McNeill & Wyatt Law Firm at the event hosted by BLSA. 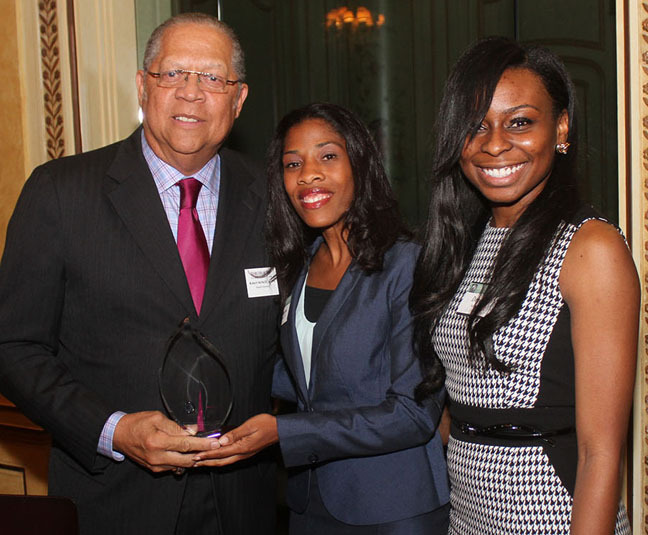 McNeill became the second recipient of the award, after former Johnnie Cochran associate, Shawn Chapman Holley was honored in 2013 by BLSA. McNeill obtained his Juris Doctorate Degree from South­western University Law School in December 1978, and subsequently passed the State Bar on the first try. “Southwestern has meant so much to me and my family that I can’t begin to express it. It has enabled me to meet many people and help me become the person that I am today,” McNeill said. He also lauded BLSA Co-President, Davetta Selma and BLSA for their role in aiding and supporting Black law students. The Black Law Students Association helps African Ameri­can students in the areas of providing clothing for interviews and also volunteer legal support for various organizations. 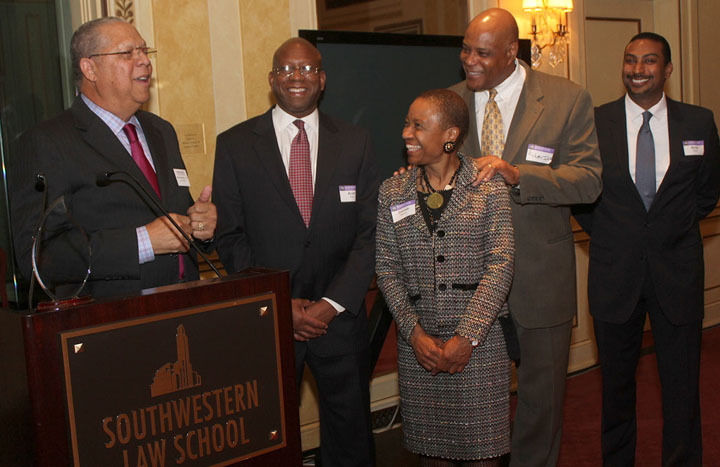 The South­western Law School chapter of the BLSA is a member of the national BLSA chapter. McNeill explained to the audience his humble beginnings from North Carolina, where he was born by a river in the shadow of a billboard hoisting the images of the notorious members of the Klu Klux Klan. “They were wearing sheets and the sign read, ‘This is Klan Country,’” he recalled. “I saw them march and I walked pass white schools to the get to segregated school on the other side of town and sometimes with no lunch and no shoes. But to get to California and go to law school at Southwestern and get good jobs, the City Attorney, the District Attorney, be in private practice with the greatest lawyers ever. I believe that’s what they call over coming,” McNeill added. McNeill followed in the footsteps of the late Mayor, Tom Bradley, who is among the most outstanding Black alumni to graduate from Southwestern Law School during its 100-year existence. He served as a Deputy City Attorney for the City of Los Angeles and as Deputy District Attorney for the County of Los Angeles, was appointed to the Los Angeles County Commission on Narcotics and Dangerous Drugs in 1993 by then County Supervisor Yvonne B. Burke, and served more than three 4-year terms until his resignation in 2008. In addition he has also served as a Deputy County Assessor from 1963 to 1977. He served as a member of the Los Angeles County Capital Case Fee Committee from 1993 to 1998 by appointment of the Supervising Judge of the Los Angeles Municipal Court. McNeill was appointed to the Board of Directors of the California Science Center in Exposition Park by California Governor Gray Davis in 2001 for a four-year term. Among his many achievements has been obtaining not guilty verdicts in murder cases as a criminal defense attorney, defending a pediatric dentist against more than 40 felony and 25 misdemeanor counts of child endangerment in a jury trial against the Los Angeles County District Attorney’s office and also fighting for the rights of women. His first case was when he was discriminated against. McNeill was told by whites that he could not live in their community because he was Black, but he vigorously fought and won and has been winning, mentoring and serving as a beacon of hope for Black law students ever since. However, McNeill cites a moment when he first listened to and then marched with the great Dr. Martin Luther King Jr. while a student in the South as one of his greatest achievements. For those organizations such as the Brotherhood Crusade and others that he has fought for pro bono, and the many former students who he gave their first job when no one else would, Mr. Robert H. McNeill Jr. may be considered the greatest person who ever lived.